So I know I kind of left it on a cliffhanger last time- the question on everyone's mind (and by "everyone's" I mean only me of course) was will she or won't she? 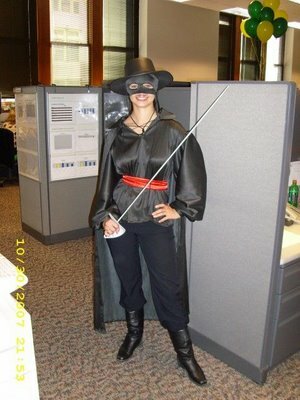 When we last left our heroes, ZB was refusing to wear the hat of her Halloween costume. We'd been trying to get her to wear it for the entire month of October to no avail. I wasn't sure what we were going to do if she balked on the big day. It was quite the nail biter. But! I am happy to report that on Halloween morning ZB got up and let me put her costume on her, hat and all, like it was no big deal. Was it because she knew that it was finally the right day to wear a costume? Was it because it was cold and she was glad to have a hat on her head? Did she see that vein throbbing on Mommy's forehead and decide to cut her a break? Who knows what goes through a toddler's mind? Anyway. I officially present...two scary and ferocious monsters! And one of the ferocious monsters is blowing you a kiss. ZB's costume was available commercially where all fine baby Halloween costumes are sold. Last year Mom made her lion costume for her, but she (meaning Mom) is having back problems and can't sit at her sewing machine for any length of time, so no free sewing labor for us this year. (Boo!) So I ran through all the costumes at Babies R Us and Walmart and Target and anywhere else that was like, "we sell overpriced poorly made polyester costumes that your child will wear exactly once!" And this one caught my eye because it was just so gosh darn cute. And made halfway decently. And not obscenely overpriced. So I was all, "Monsters it is!" I mean seriously. Have you ever seen anything cuter in your life? The only problem was that the hat was a teeny bit big and the "teeth" kept slipping over her eyes. Surprisingly (and hysterically), ZB's instinct is just to take off running blindly when this happens. My costume was a little harder. Can you believe that they don't make adult monster costumes? (Actually, that's a lie. They do. I found a couple on a website that sells fantasy lingerie. For all your monster fetish needs, I suppose. But it isn't really the kind of monster outfit that you can wear to take your child trick or treating.) So I improvised. Really improvised. First of all, it's hard to find purple fur around here. And if you do, it's something like $18/yard. Which is crazy. So I used a blanket instead. I'm serious. In the teen bedding section of Walmart, they have all these assorted furry pillows and throws and whatnot. And they are much cheaper than $18/yard (I think $14 for two or so yards worth...and lined! ), so I bought a purple throw and cut it up. Instant monster fur. Secondly, I'm kind of self-taught when it comes to sewing. My skill level is somewhere around "hem a pillow case". I couldn't read a pattern if my life depended on it. So I made up my own. The skirt is based on a wrap-around skirt that I had in my closet, the leg warmers are just material that I wrapped around my legs, sewed the seams together and put elastic band at the top. And the hat was me literally laying my head down on the material and tracing around it with a pencil for the size. I'd sew some parts together, eyeball it, and go, yeah, those sides look mostly even. Plus, monster fur is very forgiving. It's so fuzzy you can't see the seams anyway, so no one has to know about that zig-zaggy spot where the sewing machine got away from me a little. Standing together, we are monsters. Alone, I look like a giant purple bath mat with horns. So those are our Halloween costumes for this year. I think they turned out well considering that they were almost not to be. Hopefully she'll remember how much fun she had this year and not fight me so much about it next year. A Mommy can dream anyway. Edited to add: This was actually supposed to post the day before Halloween but didn't due to "issues" with the dancing video on the previous post, which gummed up the timing on these other posts. So...pretend Halloween hasn't happened yet. And then ZB came along, and that just doubled the costume fun. (Sadly, Tony has never been one for dressing up. Even when we were first dating and he was still trying to impress me, he balked at the whole couples costume idea. Sigh.) But ZB wasn't old enough to protest, so she became my costume muse. I mean, you can't be a lion tamer without a little lion, can you? But Internets, this year the best part about Halloween is in DANGER! And not fake being-chased-through-a-haunted-house-by-a-guy-with-a-chainsaw-with-no-chain danger, but real danger! Because ya'll, this year ZB does not want to wear her costume. Seems that now that she is a toddler, she's got this crazy idea to "exert her independence" and that includes refusing to wear her little costume hat. Seriously. I've been "practicing" with her for the last month to wear her hat, and she just says "No! No! No!" and pulls it off. Don't get me wrong, she thinks it is hysterical when Mommy wears it, or Daddy wears it, or CC wears it, but when it goes on her head, she wants nothing to do with it. I am very concerned! The costume doesn't really make sense without her hat, and if her costume doesn't make sense, then my costume doesn't make sense. (And I spent a lot of time making my costume by hand. Many a night I slaved over my sewing machine, and I don't really even know how to sew!) So I'm not sure what to do. If she balks tomorrow, then my plan B is to put her back into her wedding outfit and call her a princess. But I'm really really hoping that Plan A (Wear the stupid hat!) works. Does anyone know any good bribes that work on toddlers? So...yeah. I'm know it's been a few weeks since I've been on, and my excuse is that we have all been very very busy doing such awesome things that I haven't had the slightest free moment in which to write about them on the ol' blog here. (And this is the part where, having just expressed your displeasure at my absence, you sigh and decide to forgive me and then rub your hands together in anticipation of reading all this awesome stuff.) Except that, having completely set your expectations to ridiculously high levels, I have just blanked on everything that has happened to us in the last few weeks. Wait! Wait! I just remembered something! Last weekend Tony's sister Mary got married! Originally Mary wanted ZB to be a flower girl or something, but the church has some kind of rule about no flower girls under five (or something like that...I can't really remember the specifics) so Mary asked if ZB could help me and Tony carry the sacraments down the aisle for the mass part. And we said sure, that would be lots of fun, she'd love that, and Mom and I immediately went out and bought her the cutest little dress. It has a silver top, puffy white tulle and sparkles and rhinestones, so you know it was a complete hit with the under 3' crowd. ZB was so excited when she put it on that she kept spinning around and patting it and lifting the skirt part over her head. (If that doesn't say yes to the dress, then I don't know what does.) Then I found a kind of similar top (similar in that it was also silver, not that it had tulle or sparkles or rhinestones) and Tony a new sports coat, and off we went down to Charlotte where the wedding was being held. Notice how Mary was a good girl and walked down the aisle with her Daddy, so everyone was able to see her pretty dress. Of course, ZB overcame her shyness as soon as the wedding was over, because then we were headed to the reception, and there's nothing that that girl loves more than a PARRRR-TAAY! There's just something about her when the music gets started. Her toes start tapping and all of a sudden she is off like a shot, headed towards the dance floor to get her groove thing on. And trust me, she totally stole the show too. At one point I looked up and everyone else had formed a circle around her on the dance floor and clapped as she got down with her sweet toddler dance moves (read: jumping, random arm waving and spinning). She is a dancing queen. And who knew that size five black patent leather Stride Rites were such great boogie woogie dancing shoes? She enjoyed getting down and funky so much that we had to physically carry her off of the dance floor when it was time for the Bride/Father and Groom/Mother dances. She was really miffed about it too. She honestly could not understand why the bride and groom didn't want to share their special moment on the dance floor with her. Luckily, we were able to temporarily distract her with some wedding cake so that she'd be all sugared up and ready to go again when they called for group dance time. So that was our weekend. Aunt Mary and Uncle Brett got married. We discovered that the high ceilings in the church make great echoes when you yell really loud in the middle of the ceremony, (and also that being whisked out and into the cry room off the lobby is much more fun than trying to sit still in a pew with Mommy and Daddy). And we learned that when there's a party going on, little girls can completely forgo sleep. All they need is a dance floor and a good beat, and they can dance all night. Edited to add: Sorry for the delay in posting this. For some reason, blogger refused to load my video. It would load part of it and then freeze, causing great weeping and gnashing of teeth. I FINALLY compressed it enough to load, but it took sweet forever and a large chunk of my hair. All that is to say, enjoy the video. Edited again: Okay, apparently the video didn't load after all. Another large chunk of my hair is now gone. However, the video loaded just fine on facebook, so if we are facebook friends feel free to watch it there. Meanwhile, I will continue to insult Blogger's mother for refusing to upload a simple video. This is the special toddler area...age 2 and under only. Not even adults allowed. Tiny tyranny at its best. It has a ball pit! We love ball pits! except for times like this. Face plant! Eye of the tiger, baby. Eye of the tiger. Back to the ball pit! Did I mention that we love the ball pit? (So much so that I think I'm going to have to break down and put the at-home version on our Christmas list. My poor living room will never be the same). Once we mastered the toddler slide, we took on the giant slide together! Here's Mommy and ZB at the veeeeeeeery tippy top! Zb was all, "Oh my gosh that totally blew my mind! My whole short life flashed before my eyes! It was awesome but I never want to do that again". Quick bouncy time-out to ride this rockin' (literally) Harley. There was an inflatable batter's box where the ball floated on top of a jet of air. ZB thought this was magic. And finally, ZB's favorite part of the whole trip. Inflatable bouncy houses and ball pits are fun, but nothing beats pushing a button and watching the water shoot out of the water fountain! ZB and I have been playing a game to help her learn the names of body parts. I've been pointing out our mouths, noses, cheeks, eyes and hair. This time ZB wants to name them. ZB starts by jabbing her finger at my nose. Me: Good girl! That IS Mommy's nose! You are so smart! ZB grins and claps for herself. Then she sees grabs some of my hair. Me: That's right! Mommy has hair! You are really good at this game! Well, you can't win them all, I guess. We had ZB's 18 month check-up with the doctor yesterday. I am just shocked, SHOCKED I SAY that she's already 18 months old. That's a year and a half! She's such a big girl now! It just blows my mind. Anyway, how it went depends on your point of view. ZB has come to recognize it as the place where the bad people in white coats give her shots, so she screamed bloody murder whenever anyone walked into the examination room with us. Poor Nurse Lisa has been attending her since she was 10 days old and only wanted to get her temperature (under the arm no less! ), but ZB would have none of it. The doctor even took his coat off so she wouldn't associate it with getting a shot (which she didn't even get this time), but she was not fooled. She screamed The. Entire. Time. The good news is that ZB is as healthy as an extremely loud screaming horse, although her weight is only at the 8th percentile (19.8lbs), so the doctor wants us back in 3 months just to check to make sure that it doesn't drop any lower. (This has been a thing for us since she was born. She just has a really high metabolism and has trouble adding weight no matter how much she eats). But her height is pretty average for her age (2' 8"! ), and the rest of her development is normal, so I'm not really worried. She's just skinny like her mama was when she was her age (although sadly, not so much now). It's an elastic "belt" that goes only around the back of the pants so that you don't have to mess with unbuckling it for diapers or potty training. You snap it around the three back belt loops on the pants and you're good to go. Since ZB has size 18 month legs and size 12 month waist, this is going to be a HUGE help in getting her pants to fit. In completely unrelated news that has nothing whatsoever to do with toddlers and the trials and tribulations of keeping their pants up around their little waists, I've recently discovered pic-a-pix puzzles and I'm totally addicted. (I know, it's quite a jump. Stay with me here). The pic-a-pix. Does anyone else play? They're little logic puzzles that make pictures when you solve them. Last night I was solving puzzles until after midnight. Right now I'm doing the 20x20 puzzles, but I'm hoping that I can work my way up to the 100x60. They're harder, but the pictures are better. (Like way better. The 20x20 ones look like the pixilated mess you saw on the original Nintendo games. You know, the ones where you were the colorful boxy blob trying to defeat the other colorful boxy blob while it hurled colorful boxy blobs at you? It's a lot like that. But still fun). If you haven't played, I totally recommend. In another completely unrelated stream-of-consciousness jump, I'm cooking a new slow cooker recipe tonight. It's called pernil pork and it's supposed to be a Puerto Rican dish. I can't tell you how it tastes yet, but I've been sitting here smelling it cook all day and it smells DIVINE. It has cumin and oregano and chili powder and garlic in it, and the whole place smells like garlic and spices. (Garlic and spices in a good way, not in a "whoa! Your breath smells like you ate a lot of garlic and spices!" way). I'm pairing it with some decidedly un-Pueto Rican parmesan mashed red potatoes, but I don't care because I like parmesan red potatoes, and we're all about mixing international flavors anyway. (And if you believe that then I have a bridge to sell you, because our idea of international cuisine around here is frozen french fries and pizza rolls). BUT! Tonight we shall be dining on real international dinner, and I shall let you know how it turns out tomorrow. And then ZB won't have any need to wear her pretty new toddler belt, will she? So here it is, September 11th. ZB has been learning about the flag in her Mother's Day Out class. She did this during craft time. 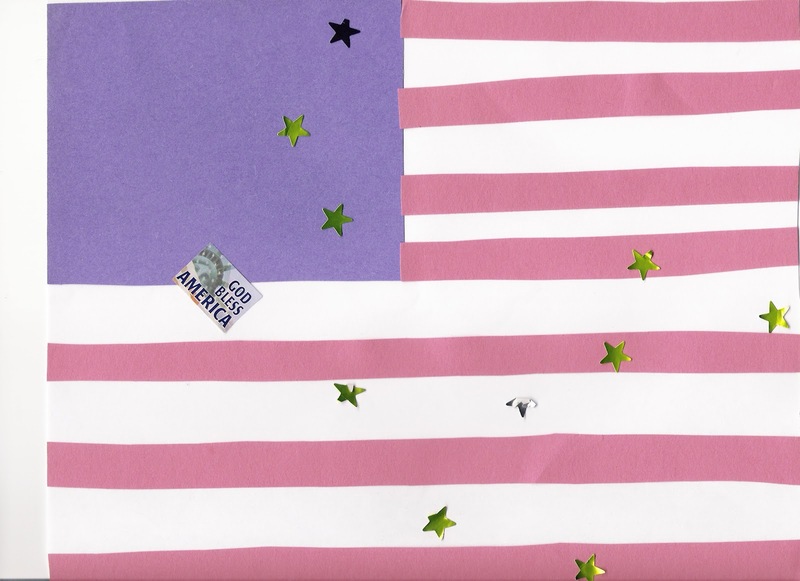 While I suspect that she had a little help gluing on the stripes, the stars are all her doing. I ask you, have you ever seen such masterful sticker work? The slightly mangled yet shiny gold stars say so much about the juxtaposition of triumph and struggle in our lives. Her use of space is refreshingly unexpected. In short, I'm pretty sure she's brilliant! Welcome back, Internets! I trust everyone is having a good week after getting a three-day weekend? Ours hasn't really been a bad week, but it has definitely been out of the ordinary. First off, the gym was open on Monday, and they're getting ready to re-open the new and improved group exercise room (with new floor and painted trim and such! ), so I went in to do a little helping out. I washed the dust from the flooring off of the walls and cleaned the mirrors and helped move equipment back in for the exercise classes to use on Tuesday. And as a thank you, the gym bought me lunch. So yes, I went to the gym to clean and eat a turkey bacon club, but not to work out. It felt a little bit like opposite day, but who am I to turn down a free lunch? 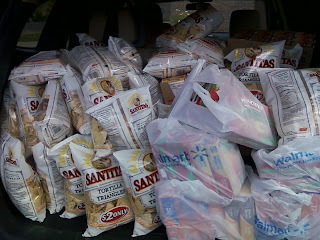 Then yesterday, Mom called and asked if ZB and I could do a little grocery shopping for her. See, her church prepares grocery bags full of goodies for all the students who are part of the college ministry, and they were shooting to fill 1000 grocery bags. And Mom was helping to organize them. So yesterday she calls me up and says, "Hey, can you go pick up some groceries for the college students and bring them to the church?" and I was like "Sure! What do you need me to get?" 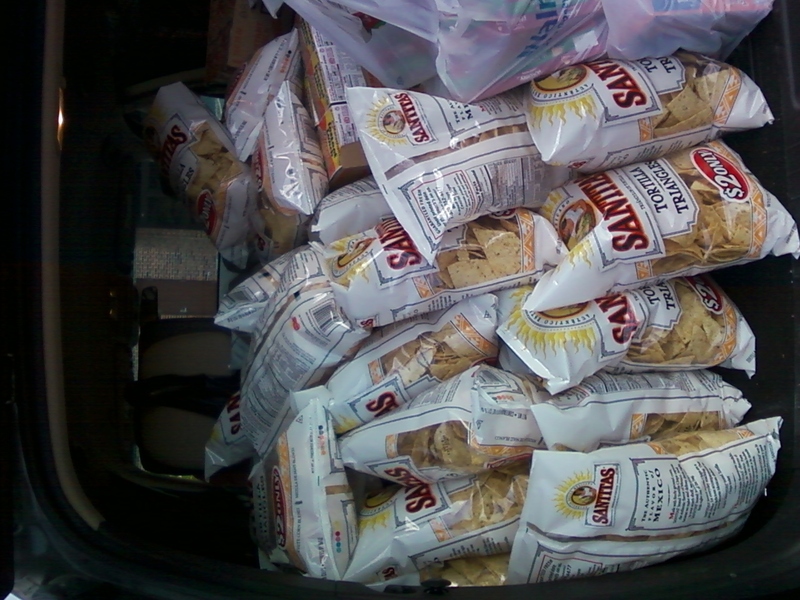 And she was like, "50 bags of chips, 50 boxes of assorted cheese and peanut-butter crackers and as many cases of Cup of Soup as you can fit into your car". And I was like, "Hahaha! No really." And she was like, "Really". 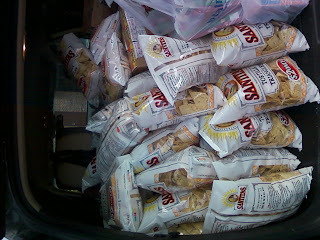 Which is how I found myself pushing two carts through walmart...one completely loaded with nothing but bags of chips and the other filled with 50 boxes of crackers and 20 cases (that's 240 cups!) of Instant Cup O Soup. (One woman passed me while I was tossing bags of chips into the cart by the handful and with a totally straight face she quipped, "Salt craving, eh?" And I was like "Yeah, but my doctor can't figure out why my sodium levels are so high"). It was really wild. ZB, however, thought the entire enterprise was the greatest fun. I let her down out of the cart (there wasn't room for her in there anyway) to help me pull chips and crackers off of the bottom row. Her job was to pull peanut butter crackers off and stack them in the floor, and then I would take her stacks, count the boxes and put them in the cart. She was very helpful, (which is what every one and a half year old wants to be). The only problem was that she didn't want to stop. She pulled stuff off the bottom row of every aisle we passed. "Floor cleaner? College students need that! Marshmallows! Check! Navy beans? Cat food? Size 4 Huggies Overnight Diapers? Check! Check! Check! I wish I had thought to take a picture of the grocery carts, but I had my hands full with a squirming ZB who now wanted to throw all the chips OUT of the cart and play again! 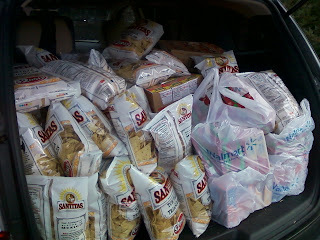 I did take a picture of the stuff once I got it into the back of my SUV because you could literally swim though that much food if you had a mind to, and to be honest, the thought of all those chips still blows me away. Of course, that was nothing compared to getting it over to the church and seeing 1000 grocery bags full of chips and cookies and granola bars and peanut butter and ramen noodles (oh the Ramen! Cases and cases and cases of freeze-dried noodles piled up to the ceiling!) Those college students are going to eat like kings! Sodium-filled, stroke-waiting-to-happen kings! Still, it's a good ministry, and the college students always appreciate it, and it was fun being able to help them out. (Lest you think that we are destroying the local college student population by filling them with fatty, salt-laden snacks, know that there are healthy foods in the bags too. My part of the list just happened to be the tasty salty section, hence what you see here. Next year, if I happen to get the apples and All Bran part of the list, I'll be sure to show that on here also). Edited to add: Well I was all impressed with my 50 bags of chips until ZB and I went back over today to help and witnessed a Ford Fusion packed with 200 bags of chips. Now THAT was something to be seen. There was just one little bubble of space for the driver and the rest was filled with chips. This is going to drive the chip manufacturers forecasting programs wild. Anyway, I tried this one last night, and it was pretty and easy and tasty. Toss together a salad and some garlic bread and you are guaranteed to impress your friends and family with your awesome Julia Child-like ways. 1/2 cup diced white onion (Note: I used a teaspoon of onion powder instead...seemed to work just as well). 1 teaspoon minced garlic (Next time I'll use more garlic. It was okay like this, but we like lots and lots of garlic in this house. Up to you on how much you like it and if you're expecting any romance later). 1) In a large skillet brown beef and onion. Add garlic and cook for one minute. Drain. (Mine took longer than one minute. I guess just brown until it's brown). 2) Add spaghetti sauce and water and simmer for about 5 minutes. 3) Mix ricotta, 1 1/2 cups mozzarella, 2 Tablespoons Parmesan, egg and parsley in separate bowl. 4) Pour 1 cup of spaghetti meat sauce into a 4 to 6 quart sized slow cooker. Place half of the noodles and half of the ricotta mixture on top of the sauce. Cover with 2 cups meat sauce. Top with remaining noodles (If the noodles don't fit exactly break them to fit) and cheese mixture and meat sauce. 6) Sprinkle with 1/2 cup of mozzarella and remaining Parmesan. Recover with the lid to melt the cheese and let it sit for 10 minutes before serving. Note: Do not overcook and don't try to speed up the process by cooking it on high. Works best with a 4 to 6 quart size slow cooker. Toughest critic says "More please!" Anyway, the whole reason why Stanley Steamer is coming is because we bought a new mattress a few months ago. And because new mattress warranties are voided by any kind of stain whatsoever, we bought the super-duper money-back guaranteed waterproof mattress pad protector. It has a 10 year warranty! It has space age polymers! It will protect your mattress through the Apocalypse! So we bought one. And then we unleashed the cats. Here's something you should know about the cats. Cats have hairballs. Five times the cats equals five times the hairballs. And on top of that, Dixon has a nervous stomach, which means that if ANYTHING unexpectedly changes in his environment (we go on vacation, we change laundry detergent, the full moon corresponds with the third Monday in a month ending in R), he will pull a Linda Blair all over your bed/floor/nicely folded pile of clean laundry in seconds flat. So we asked the mattress sales guy if this mattress pad protector was up to that challenge, and he was like, "Oh absolutely! Money back guarantee! Did you see the part about the space age polymers?" And to be fair, the mattress pad protector did manage to protect the first 9 times that a random cat (cough Dixon! cough!) barfed on the bed, but I'm afraid that time number 10 just did it in. Even space age polymers can't handle that rigorous of a barf, wash, repeat cycle. So now there's a cat barf stain on the mattress. We called the pad protector people, and they were shocked! SHOCKED I say! that their space age polymers were bested by cat barf. And I was all, "Yeah, that's the precise reason that Dixon flunked out of the space program...incompatible with polymers." (Which I thought was pretty funny, but it just seemed to confuse the mattress pad people, so I let it drop). Meanwhile, what are we supposed to do about this stain on our new mattress? In the end, the mattress pad people offered to send us a new mattress pad protector (now with more polymers!) and pay to have people come out and remove the stain from the mattress. Which is why I am frantically cleaning the house in expectation of Stanley Steamer coming to pay us a call sometime between noon and 5pm today. Of course, the sound of the vacuums and cleaners and whatnot will scare Dixon enough that he will barf on the bed again, so it's all a vicious cycle. Those space age polymers better be out of this world.